Nepal has enjoyed growing advantages with its Chinese neighbors. Connected to China's Tibet Autonomous Region, Nepal has seen rising benefits from the development in the region. Last year, the trade value between China's Tibet Autonomous Region and Nepal increased 4.6 percent compared with 2017, accounting for 52.6 percent of the total annual trade value. Meanwhile, in broader terms, the construction of the Trans-Himalayan Economic Corridor and the China-Nepal Cross-border Economic Cooperation Zone is also making steady progress. Although there are some barriers for the development of Nepal when it comes to inadequate energy, transport and infrastructure, Nepal has seen good perspectives from the significant support from China. 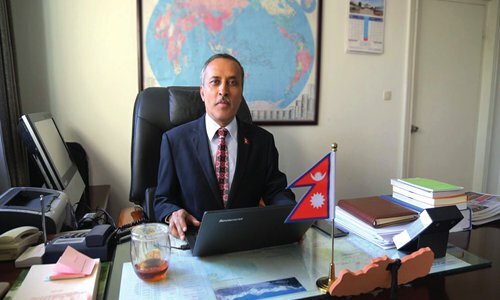 The Global Times (GT) talks with Leela Mani Paudyal (Paudyal), who was the Nepalese Consul General in Tibet Autonomous Region from 2003 to 2007, and is now the Nepalese Ambassador to China. He spoke with us on Sino-Nepalese relations and his perspectives of a changing Tibet. GT: The Nepal Investment Summit took place in Kathmandu from March 29 to 30, which showed the Nepalese government's efforts in attracting foreign investment to Nepal. How could the messages be different in relation to other investment activities in Nepal? Paudyal: First of all, it's about timing. Our previous investment activities were also for the promotion of Nepal, but the political situation in Nepal was not very stable at that time. We received complaints from investors before that the major problem for them is the inconsistent foreign investment policies due to the change of government. But this time, the government has been in power for five years and this government has the majority seats in the parliament, which ensures the consistency of the government's policies. Second, the government is more prepared for foreign investment in Nepal. The government has already changed some policies and regulations and is ready to listen to the investors and make more changes suitable for investment. Third, China and Nepal have a very good political understanding and enjoy excellent bilateral relations, and have a problem-solving mechanism to conduct China-funded projects and facilitate the investments from China. That's why this is the most appropriate time for foreign investors, especially the Chinese investors in Nepal. GT: The energy supply has increased significantly in Nepal and there is vast potential to tap into resources to match the rapid expansion of the economy and reduce Nepal's dependence on India. What does the Nepalese government plan to do to diversify its import of energy supply? Paudyal: Currently, we are diversifying our sources of energy within the country and increasing our supply capability to reduce the dependence on India. In the long run, we have a huge potential to develop energy for our own consumption and for the regional market. Currently, our main focus is to meet the demand and substitute our own imported energy and fossil fuels, our main source of energy now, which needs to be replaced by green and clean energy, specifically hydroelectricity. That is what we are planning to do now. The investment forum on March 29 will also focus on attracting more investment, in particularly in the power sector. China has very good experience in developing hydropower as well as other new energies. Nepal has very rich natural resources and we want to utilize these resources for our economic development. We expect more and more Chinese enterprises to tap into this potential in Nepal and we are tuning our policies to ensure a good rate of return for the investors in the power sectors with a market and minimum price guarantee. Almost all the equipment for the production of power is imported from China. Familiar technologies developed in China coupled with recent experience on similar topography of generating power are the added advantages for the Chinese enterprises to work in power sector in Nepal. GT: China and Nepal have seen a significant escalation in exchanges and cooperation at varied levels including the development of transit between the two countries. Yet some Indian media take this as a "threat." In your opinion, how should China and Nepal balance this relationship with India in economic and trade cooperation? Paudyal: I completely disagree with the statement of making balance and threat. Getting a transit facility from China is the right of a landlocked country by international law. Any landlocked country can have the transit right. There is no logic and rationale in such a statement. In the past, there was no convenient transport infrastructure to connect Nepal with the seaports of China except for two highways connected through Tibet. But China in recent years has been developing adequate transport infrastructure in its country, including towards the Nepal-China border. The railway network that China has developed throughout the country including that close its border with Nepal made transit facility feasible. We are planning to develop more modern and efficient transport infrastructure across the Nepal-China border including railways. We are confident that we will be able to expedite this task in the near future to make transit facility economically viable and efficient. Connecting with Chinese railway network is connecting with the outside world to Europe and to Central, South and North Asia. China has excellent and growing relations with all those neighbors and constantly engages in economic activities with them. I believe that there are more areas of cooperation than confrontation and all the neighbors can benefit from China's rapid economic development. We should come out from a hostile mentality to enhance cooperation with neighboring countries. GT: The Belt and Road Initiative (BRI) is intended to promote China's cooperation with Central Asian and Southeast Asian countries, in areas of trade and monetary cooperation, traffic connectivity and people-to-people exchanges. Yet some claimed that the BRI would lead some countries into a "debt trap" or "regional hegemony." What is your response to this? Paudyal: This is a completely wrong notion, which we cannot accept. If some foreign experts say that they are worried about a "debt trap" from Nepal-China economic cooperation projects, I humbly thank them for their concern and also would like to request them to let us handle Nepal-China economic projects on our own. Please understand that we can take care of our interest and refrain from taking unsolicited advice unless and until we request their advice. We have trouble-free relations with China, and we have no problem dealing with China. China never interferes in our internal affairs. The support that we have received from China until now has no intrusion on our internal affairs. After the heavy earthquake in Nepal in 2015, China was the largest contributor to Nepal's reconstruction and rehabilitation. We can continue mutually beneficial cooperation. We need different sources of capital and funds for economic development, particularly in infrastructure development, agriculture and digital technology. Currently, the largest loans that we have borrowed are from the World Bank, and the Asian Development Bank but not from China. There is growing concern, and several researches have revealed that a very large chunk of the development support received from developing countries goes back to the source countries. This phenomenon applies to the loan we received from multilateral agencies as well. We need to review such cooperation to reduce the burden of debt. GT: This year marks the 60th anniversary of democratic reform in China's Tibet. As China's neighboring province to Nepal, Tibet has seen dramatic changes in the past decade. How do you see the development of Tibet? Paudyal: The magnitude and impact of development of the Tibet Autonomous Region is magnificent. I have seen Tibet's development over the last 19 years. The first time I visited Tibet was in 1999 and I worked there from 2003 to 2007. The last time I traveled there was in 2018 with our prime minister. The magnitude of the development and the transformation of the livelihood of the people is outstanding. We visited some of the remote places in Tibet and the life and the facilities that they have been enjoying were excellent. The development that we have been witnessing in Tibet is also a source of inspiration for the transformation and development of Nepal. Nepal also has very difficult terrain with around 80 percent of the land being high mountains, and hills vertically divided by hundreds of rivers and rivulets that make development of infrastructure difficult and costly. In Tibet, we were told that all the villages are connected by the road networks and the poor households have received basic livelihood support from the governments including houses built by the government. Also, because of the huge development of the tourism there, the local people can sell their traditional handicrafts to the tourists and can engage in many other economic activities created by tourism. If Nepal can enhance our tourism and double our tourist numbers from 2018 to 2020, we can create a lot of job opportunities for the people of Nepal, and that is what we have seen in Tibet. In Tibet, the government has also invested a lot in the restoration of historical, cultural and religious places, making it a major tourist attraction. We can learn from all of these things.